Memorial Day is a time for remembering and honoring those who have given their lives in defense of our country. In that defense, there are so many who survived but carried with them the scars of battle. 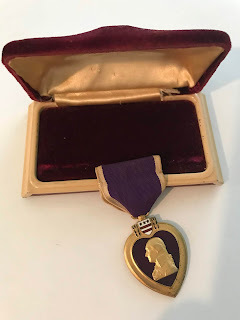 Many of those have been honored with the receipt of a Purple Heart...a military decoration given to those who are killed or wounded while in the service of country. This is a Purple Heart. This is the story behind one Purple Heart. According to a military newsletter called Dog Tag, Carl Holbrook was 23 years old when he left his home town of Ft. Payne, Alabama, and entered the Navy in May, 1942. After receiving his basic training at San Diego, California, he was sent to North Africa to complete his training with the amphibious forces. He was wounded on the beach at Salerno, Italy, shortly after Italy's surrender to the Allies. At 3:30 a.m., September 9, he was on the beach at Salerno, part of a Naval Beach Platoon whose mission was to set up a communications system. It was while he and three others were unloading equipment from a small boat on the shore that a sniper shot him. He fell behind a box of ammunition. It afforded him his only protection for about half an hour, while the German, in a cedar tree 125 yards away, picked off two of his comrades. One of them, an Army engineer, fell dead across Holbrook's body. After the Army anti-aircraft guns had found the sniper, Carl had time to discover that the telephone he had been carrying under his arm had six bullet holes in it. It wasn't until he reached the hospital at Oran that he was told that the German's bullet had missed his heart by three inches. His shoulder was badly damaged and he spent almost a month at Oran. On his homeward trip across the Atlantic, it was found that three German submarines were accompanying the convoy, two days out from the Straits of Gibraltar. Three days later, depth charges had disposed of them. One day out from New York, the ship endured a terrible storm but reached port safely 21 days after leaving North Africa. Carl was at St. Alban's Hospital, New York, until he was transferred to Memphis. His recovery took more than a year. Carl Holbrook carried those scars in his body and in his spirit for the rest of his life. After the war, he became a telephone company lineman and eventually became the general manager of a small, independent telephone company in southwest Florida. He was a husband and a father. On June 10, 1967, he was best man at the wedding of his son and me. He was a busy, fun-loving man who left us much too soon in February, 1970...a man whose service to his country earned him a Purple Heart.